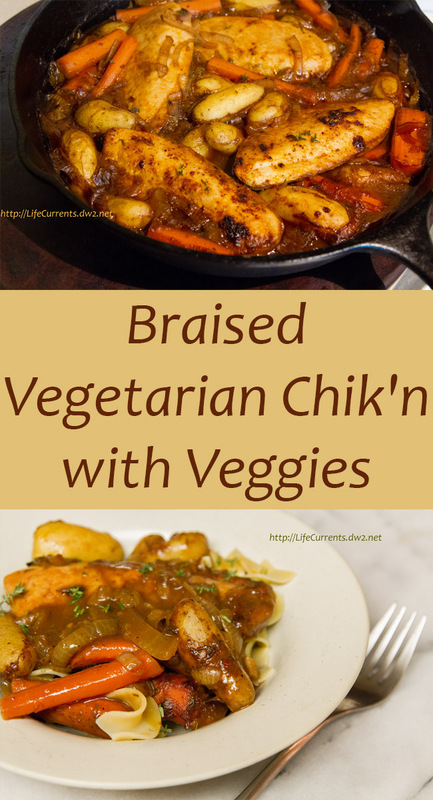 Braised Vegetarian Chik’n with Veggies – For a long time I’ve thought that if I went back to eating meat, I’d entirely skip over chicken, and go directly to steak. I mean, chicken is often dry and flavorless. When was the last time you heard anyone rave about that piece of chicken they had for dinner last week? I know, their downfall is that they’re processed. And, well, I’m willing to give in on that. If the idea of fake meat is too weird for you, try tofu or real chicken in place of the “chix”. I also think this would be delish as a stew with lentils or white beans instead of the chix. And, how did this Braised Chicken taste? It’s awesome! I’ve made it twice now and each time Dan was left telling me how good it was. It’s super comfort food. And, really healthy all at the same time. I just love it! I think next time I make it I might try adding 1 teaspoon smoked paprika to the spice mixture. We had some leftovers, and I decided to make mine into a sandwich. Here’s the braised chik’n breast with avocado, lettuce, and tomato on toasted whole grain bread. Super yummy! Dan and I were joking yesterday that if I were left on my own, pretty much every meal would be soup and/or sandwiches. Well, as long as tacos count as a sandwich! Preheat oven to 350 degrees F. In a small bowl combine brown sugar, chili powder, salt, ground black pepper, and crushed red pepper; rub into chicken. Let stand 10 minutes. In a large cast iron skillet or other oven-proof skillet, heat oil over medium-high heat. Add spice rubbed chicken; cook until browned on both sides. Remove chicken from skillet, and set aside. In the same skillet, add the onion, carrot, and potatoes, and cook about 5 minutes or until beginning to brown. Stir in flour; cook and stir 1 minute. Stir in soy sauce, broth, and thyme. Bring to a simmer. Return chicken to skillet. Cover with aluminum foil, and bake 40 minutes. Serve over cooked egg noodles, sprinkled with thyme and additional black pepper. *The amount of soy sauce varies depending on how salty your broth is. Salty broth? Use 1 tablespoon. No salt in the broth? Use 2 tablespoons soy sauce. My daughter loves Quorn! She has been a vegetarian for about 10 years now. I will have to pass this recipe on to her. She is in college and looking for good recipes to make while there. Thanks for sharing on Foodie Friends Friday. I hope you will come back next week with another wonderful recipe! Awesome! It makes me happy that you found the recipe! I’m also excited that someone will try it with the Quorn. 🙂 We eat it all the time around here! Love it! Great recipe. Thanks for sharing at FFF this week.